Because sometimes a girl needs a dragon, not a knight. Well. There was one thing. Her cheeks flared crimson and she squirmed a bit before stuttering out another question, swallowing back her embarrassment. His head tipped to one side, and he looked her up and down anew. She suspected he was just noticing her frayed cuffs and cheap shoes. He’d been so intent on getting whatever it was he wanted out of her that he hadn’t paid attention to the package it came in until now. When she caught the very slight curl of his lip, there and gone in a flash, embarrassed heat filled her cheeks. He slowly rose to stand, heaving a sigh as he settled back on his heels. Kimberly would have asked what he meant by that, but the look in his eyes froze her in place. His eyes burned a molten gold as he spread his arms, which were expanding and shifting at an alarming rate. Faster than she might have thought possible, he was growing, his clothing melting and skin disappearing under a layer of metallic scales. Nearby, people were noticing, shouting and screaming in fear as they stampeded in every direction to escape the shapechanging Other in their midst. When he ceased growing, from the tip of his nose to the end of his tail, he was over thirty feet long, with a wingspan half again that size. Kimberly sat immobile, unable to so much as squeak in terror as the beast before her lurched back to arch its neck and spread its wings, barbed tail lashing as it growled at her. One thick, talon-tipped paw lashed out, flattening her on the grass and squeezing the air out of her lungs. It gave an awkward, one-legged hop forward to catch its balance before clenching its claws to dig deep furrows in the grass and close around her waist and legs, pinning her. Then those wide, ribbed wings began to flap, the sun playing off the tones of brass and copper and gold. The ground fell away, people scattering before the airborne monster. And Kimberly could do nothing but pray, staring up at this great beast that had her in its claws. She’d gotten what she’d asked for. Now she would have to pay the price. I'm a displaced New Yorker with a penchant for the silly, the obscure, and the fantastical. Tampa, Florida is home for the time being. I'm currently working on the H&W Investigations urban fantasy series and the Blackhollow Academy young adult contemporary fantasy series. 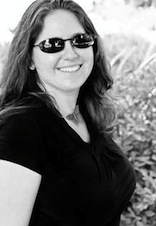 Find out more about my books, drop me a line, or join my mailing list at www.jesshaines.com! 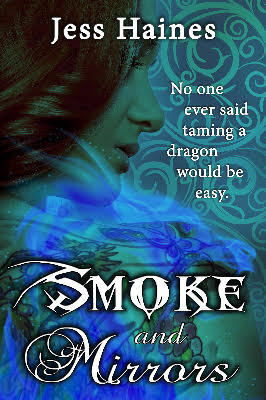 $10 Visa/MC gift card, a signed physical copy of Smoke & Mirrors, and a plush dragon!